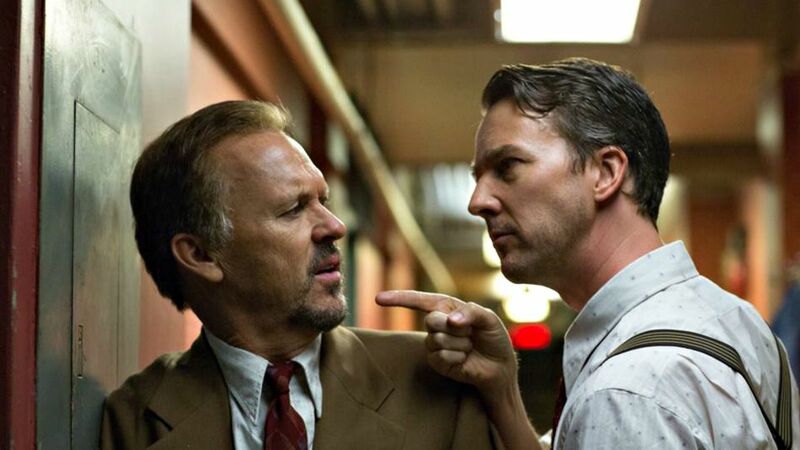 “Popularity is the slutty little cousin of prestige” remarks Mike Shiner (Edward Norton), a method actor recently hired to play a key part in Birdman or The Unexpected Virtue of Ignorance. Directed by veteran dramatic director Alejandro Inarritu (21 Grams, Amos Perros, Biutiful), Birdman follows a Broadway stage production over the course of several days, capturing the cynical characters of it’s production. The film’s titular character is actually the superhero alter ego of Riggan Thompson (Michael Keaton), a washed-up, aging actor set on reclaiming his past glory by directing and starring in his own play called “What We Talk About When We Talk About Love”. Riggan has faded from glory since his role in the blockbuster Birdman films, and though his influence in the artistic community is waning, Riggan is committed to becoming the Next Big Thing. Living partly in his fame-seeking fantasy world guided by the Birdman character from his films, Riggan’s desperate attempts at producing an authentic work of art collides with disillusionment with reality and increasing disconnect with those around him. Despite Inarritu’s affinity for the bleak and somber, Birdman is incredibly upbeat and vibrant. Keaton is fantastic as the leading role, and gives a performance that is both inspiring, bizarre and desperately meta (Keaton himself was the star of Tim Burton‘s successful Batman films from the early 90’s). Norton’s performance of Mike Shiner is also fantastic as he is essentially playing a younger, more successful version of Riggan. The rest of the all-star cast is composed of Zach Galifianakis as Riggan’s lawyer/agent Jake, Emma Stone as Riggan’s daughter Sam, and the always-excellent Naomi Watts as Lesley, the actress and former lover of Mike. Birdman is entirely shot in one simulated take, giving the audience a feel that we are watching a play-within-a-play unfold as characters come and go on set and in between acts. The camera acts as a sort of character itself, swooping in and out of scenes at will, sometimes tracking characters for 20 minutes or more. It’s absolutely mesmerizing to watch, and should make for a shoe-in Best Cinematography nominee come Oscar time. Though Birdman makes a point to capture various points of view, most of the drama revolves around Riggan’s denial of reality and constant distance from those closest to him – namely, his daughter and ex-wife Sylvia (Amy Ryan). Though I was expecting a bit more laughs in something billed as a “Dramedy Satire”, Birdman provides some incredibly thought-provoking commentary about fame, relationships, and staying relevant in an increasingly disconnected world. Rarely is the existential crisis this cool.